^ a b c d e 田中冨久子『女の老い・男の老い：性差医学の視点から探る』<NHKブックス> NHK出版 2011年、ISBN 9784140911778 pp.62-65. ^ a b c d e f g h i Hirshkowitz, Max ; Whiton, Kaitlyn et al. (14 January 2015). “National Sleep Foundation’s sleep time duration recommendations: methodology and results summary”. Sleep Health: Journal of the National Sleep Foundation (Elsevier Inc). doi:10.1016/j.sleh.2014.12.010. http://www.sleephealthjournal.org/article/S2352-7218(15)00015-7/fulltext 2015年2月4日閲覧。. ^ Daniel F. Kripke; Robert D. Langer; Jeffrey A. Elliott; Melville R. Klauber; Katharine M. Rex (2010). “Mortality related to actigraphic long and short sleep”. Sleep Medicine 12 (1): 28-33. doi:10.1016/j.sleep.2010.04.016. ^ Meyer, Matthew (2012). 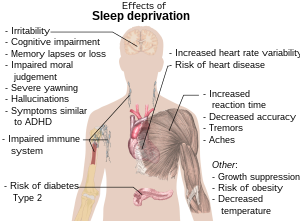 The slumbering masses : sleep, medicine, and modern American life. Minneapolis: University of Minnesota Press. ISBN 0-8166-7474-4. OCLC 788275263. ^ Taheri S, Lin L, Austin D, Young T, Mignot E (December 2004). “Short sleep duration is associated with reduced leptin, elevated ghrelin, and increased body mass index”. PLoS Med. 1 (3): e62. doi:10.1371/journal.pmed.0010062. PMC: 535701. PMID 15602591. http://dx.plos.org/10.1371/journal.pmed.0010062. ^ Weljie, Aalim M.; Meerlo, Peter; Goel, Namni; Sengupta, Arjun; Kayser, Matthew S.; Abel, Ted; Birnbaum, Morris J.; Dinges, David F. et al. (2015). “Oxalic acid and diacylglycerol 36:3 are cross-species markers of sleep debt”. Proceedings of the National Academy of Sciences 112 (8): 2569–2574. doi:10.1073/pnas.1417432112. ISSN 0027-8424.